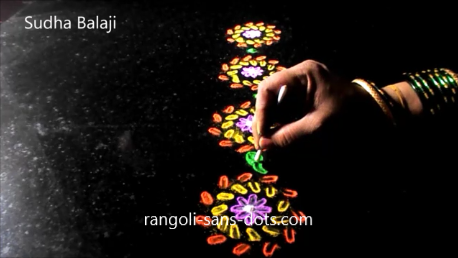 Awesome rangoli designs collection website - Rangolisansdots ! 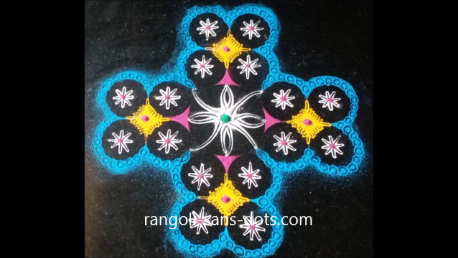 It is a collection of traditional , modern , easy and difficult rangoli designs , there is something for all in this website primarily for rangoli with some recipes , crafts and ideas on festival celebration too. 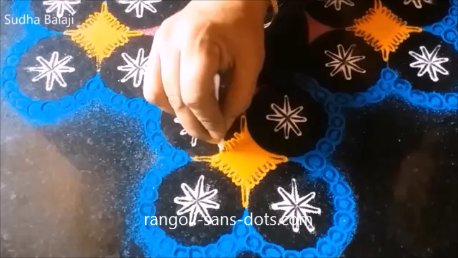 First let us start with a small peacock rangoli . I have added the video for the steps. Mark the centre with a white dot. With that as reference draw lines radially. Blue and green lines are drawn touching each other. Using the index finger form feathers so that we get blue green combination. 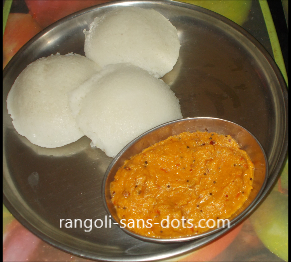 Then fill with orange colours. 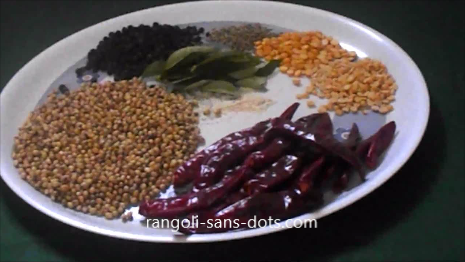 Draw the body of the peacock , neck and head free hand as shown in the video and fill with colours. The gaps in the plumage are also filled with blue and green colours. The result a beautiful peacock design that can be drawn very easily probably even by children for their school competition or by us for festivals like Deepvali or Sankranthi. This is a different type of design using bangles and cotton buds. The images will help us get through the procedure step by step. After placing the bangles as shown in the photo above use a single colour ,green in this case to place dots along the circumference , inside and outside. 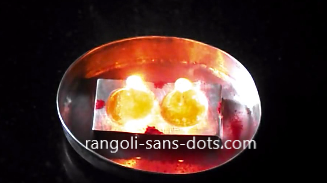 Then remove the bangles gently without haste otherwise the bangles can smudge the dots. Using a cotton bud form patterns so that they appear to be tangential ( i.e at an angle when seen from all sides ) . 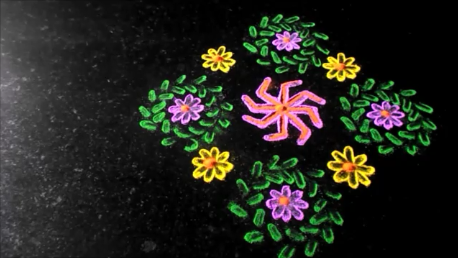 Using a cotton bud , convert the previously placed pink bullets into flower designs. 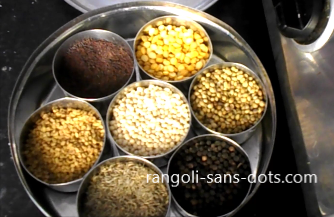 The gaps seen are further filled with yellow flowers using rangoli colour and cotton buds. 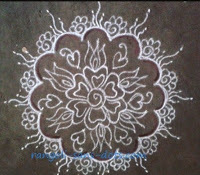 The rangoli after completion , place diyas at the four corners and this will give a great ambiance. Place four or five bangles, minimum four are required because we avoid three for auspicious occasions. After placing the bangles place dots inside the bangle . I have used yellow colour inside. Then use a bright and contrasting colour outside. I have used orange in this design. Remove the bangles gently , if there is any small smudge , carefully remove it with the finger. 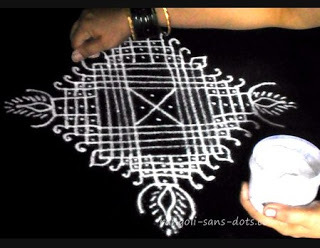 Then using the cotton bud extend the the dot tangentially so that we get a unique pattern as shown i the image below. 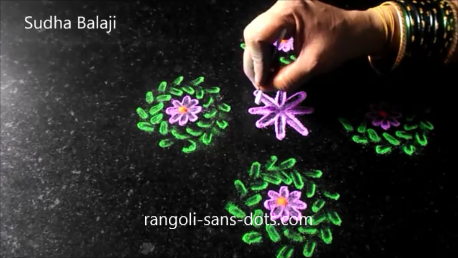 Next connect all the floral designs formed with leaf like patterns formed with green rangoli colour and cotton bud. 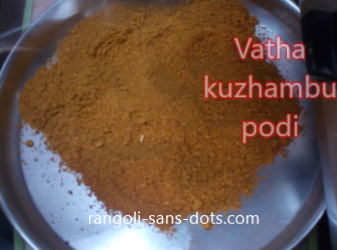 Place white dots inside to complete the rangoli. 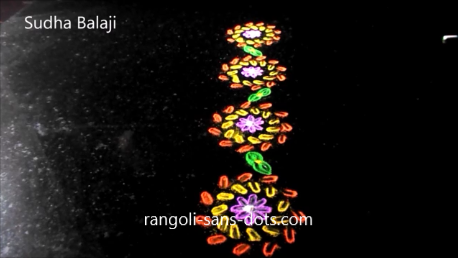 Placing diyas between the floral patterns will enhance the beauty of the rangoli. 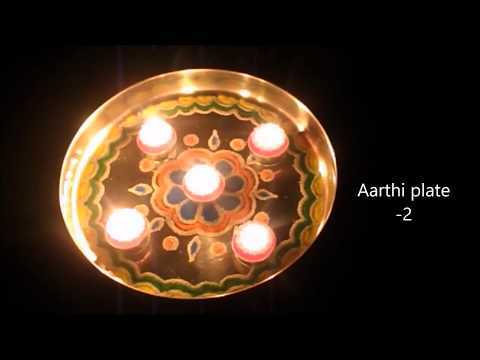 Diwali is the one of the most popular festivals and one of the best times of the year for celebrations and joy. For innovative designs we can make use of bangles, cotton buds. The two designs above are created using these two tools primarily. 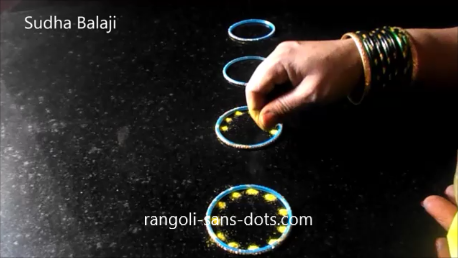 Next is the use of paper cups to create beautiful rangoli designs that are colourful and symmetrical too. The photos below show the steps. 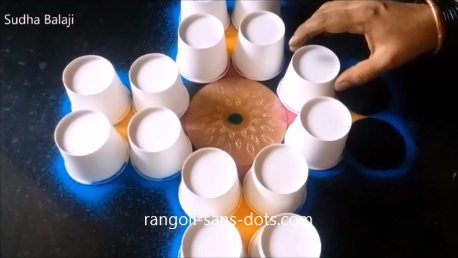 Place the paper cups in a pattern around an old CD as shown. Draw the outline i.e outside the paper cups. Remove the cups. 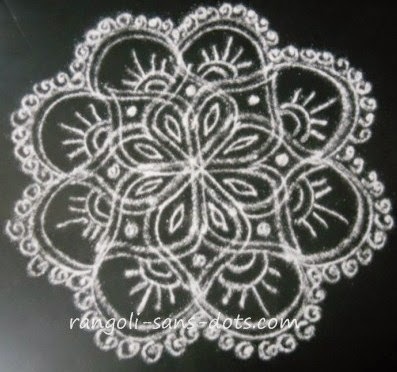 and the CD after marking the centre of the CD with rangoli colours. 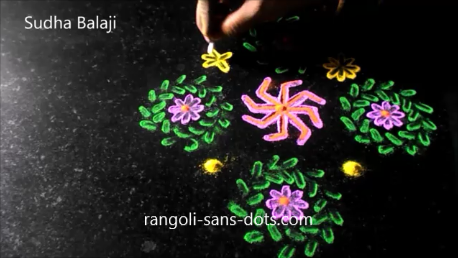 Using rangoli colours and cotton bud create the designs inside. I think kids may like to create such easy designs.